Grapes are a type of fruit that grow in clusters of 15 to 300. There are hundreds of types of grapes that are found all over the world but most of them have smooth, thin and soft skin with crimson, black, dark blue, yellow, green, orange, and pink skin. Grapes can be "White" in color. White grapes are actually green in color, and are evolutionarily derived from the purple grape. Mutations in two regulatory genes of white grapes turn off production of anthocyanins, which are responsible for the color of purple grapes. Grapes can be consumed in many ways, they can be eaten raw or they can also be used in making juice, wine, and jelly or Grape seed oil. People also dry them to make raisins. Grapes are the storehouse of numerous health promoting phyto-nutrients, antioxidants, Vitamins C, B6, potassium, calcium, iron, phosphorus, folate, magnesium and selenium. Flavonoids are the most powerful antioxidants that help to fight against skin damaging free radicals. 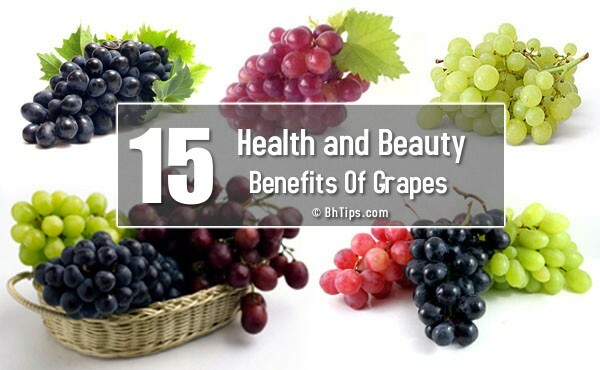 The most well known health benefit of grapes is on the eyes. Grapes are very good for eyes. Grapes are rich in lutein and zeaxanthin, which are responsible for maintaining good eye health as we age. Grapes not only prevent heart attacks but can also treat them to some extent. Red grapes prevent internal blood clots by boosting nitric oxide levels in the blood. They are also natural antioxidants and thus they reduce the level of LDL cholesterol. This in turn helps in avoiding the blockage of blood vessels. Migraine can be cured using grapes. In fact, ripe grape juice is an age old home remedy for migraine. The ripe juice should be taken pure, without adding water to it early in the morning. Grapes contain cellulose, organic acid and sugar which make them a laxative food item. Grapes not only cure constipation but also helps in toning up the stomach and intestines thereby solving the problem of chronic constipation too. Recent scientific study says, purple coloured concord grape juice helps in preventing breast cancer. During an experiment, significant reduction in breast tumor mass was seen after the person was fed with the grape juice on a daily basis. Pterostilbene is a compound which is present in grapes and that helps a lot to lower the blood cholesterol level. Daily consumption of a bunch of grapes is very helpful in lowering down blood Cholesterol. Resveratrol in grapes helps in reducing the levels of amyloidal-beta peptides in patients who suffer from Alzheimer’s disease. Grapes are also helpful in enhancing the health of brain and delay the onset of age related neurodegenerative diseases.The flavonoids in grapes have also been shown to improve cognitive function and reduce memory loss. The fleshy part of grapes as well as the extract of its seeds contains proanthocyanidins and resveratrol which are powerful antioxidants. Application of grape seed extract on the skin provides protection against harmful effect of ultraviolet radiation. It acts as a sunscreen, by reducing the redness caused due to sunburn and also minimizes the damage borne by the skin cells. Due to protection against UV Sun rays, grape seed extracts and resveratrol are often used as ingredients in sunscreen lotions. Catechins and Anthocyanins are two classes of antioxidants that are found in red grapes in abundance. These phytochemicals have demonstrated anti-bacterial and anti-viral and protect you from various infections. Powerful antioxidants present in grapes enhance your immunity and protect you against various infectious bodies. Try to consume a bunch of grapes on a daily basis. Red grapes have high therapeutic values that can cure asthma. The assimilatory power of grapes is high, which increases the moisture in the lungs which in turns cure asthma. Grapes are a popular natural remedy to cure dyspepsia (indigestion). Approximately 15-20 grapes, or a glass of grape juice, are the suggested amount to soothe irritation of the stomach lining and cure indigestion. Free radicals are the main cause of premature ageing which is characterized by the appearance of wrinkles and fine lines on the skin. . The antioxidants present in grapes, along with vitamin C, protect the skin from the harmful effects of free radicals, and reverse the appearance of wrinkles and dark spots. Grapes also help in toning the skin. You can reduce the formation of wrinkles by following given instructions. Take some grapes, wash them and remove their seeds. Rub the pulp of a few seedless grapes on the face in a circular motion. Leave it for about 20 minutes and then wash off. Regular application will help in reducing the formation of wrinkles. Grape seed extract is rich in Vitamin E which retains the moisture of the skin. This extract also acts as an exfoliant. Scrubbing the skin with it results in the removal of the top layer of dead cells, thus give you soft and smooth skin. Powerful anti oxidants present in grapes protect the body against free radical damage and slow down the aging process. Daily consumption of grapes as well as application of grapes juice on your skin is highly beneficial to slow down aging process.